Bigfoot Vac Sweep is a square attachment that transforms standard vacuum cleaners into maximum-performance professional tools. Its dimensions are engineered to create a constant sweeping motion in any direction on virtually any non-porous surface. There are a wide range of vacuum nozzles currently on the market, but most require cumbersome back-and-forth motions and sidestepping to hit every spot. Additionally, most nozzles stick to the floor when going forward and again pulling backward. These attachments may also hinder the vacuum’s performance, reducing its suction power and losing velocity in open spaces. Additionally, it can be nearly impossible to steer big, clunky vacuum cleaners underneath beds and other furniture, around workshops, and more. 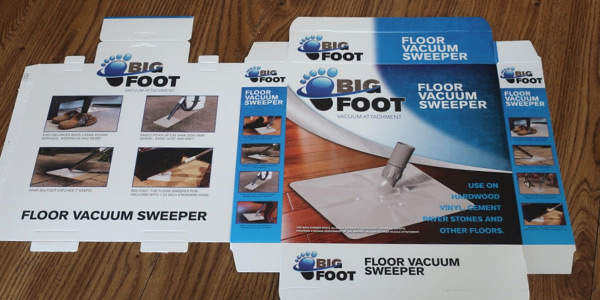 Bigfoot Vac Sweep improves the functionality and design of vacuum attachments. This innovative product features a 10” square plate, made from ABS plastic, with a swiveling attachment in the center. The plate stands 2.25” tall, designed to fit vacuum cleaners with standard tapered 1.25” hoses. Additionally, its dimensions are engineered to create a constant sweeping only motion, while its size makes it ultra-convenient to glide under tight-fitting spaces. Further, the design also increases the 1.25” pipe inlet area by 110 times; the frontal area is enlarged between 10.5” and 15,” depending on the direction of travel. The lower surface is engineered to have only surface flow, not vertical suction, so that the full air horsepower is used to sweep the floor for a better overall cleaning experience.